Thisstory was updated at 12:05 p.m. ET. NASAhas delayed the start of major repairs on the International Space Station untilFriday to give engineers more time to plan two spacewalks required to fix theoutpost's ailing cooling system. 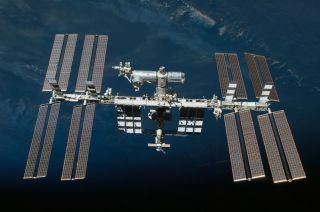 Spacestation managers had hoped to be ready to begin replacing a faulty ammonia pumpin half of the space station's U.S. cooling system by Thursday, but the resultsof an underwater practice session by astronauts on Earth forced a delay. Thecomplicated spacewalk repairs are now targeted for Friday and Monday. Americanastronauts Douglas Wheelock and Tracy Caldwell Dyson will perform the two emergencyspacewalks to replace the faulty ammonia pump with one of four sparesstored on the space station's exterior. Two other astronauts are performingseveral practice dives at NASA's massive spacewalk rehearsal pool in Houston tohelp plan the complicated repair job. CaldwellDyson said Monday that the ammonia pumps are "gigantic" and about thesize of a laundry dryer box. It weighs 780 pounds (353 kg) and is 5 1/2 feetlong (69 inches) by 4 feet wide (50 inches). They are about 3 feet tall (36inches), making them very bulky and difficult to move. "We'regoing to split up and one of us is going to take the failed one out and theother is going to prep one in a different location and then we're going to joinup, swap one out for the other," Caldwell Dyson told the World ClassRockers, a band that was visiting Mission Control at the time. Caldwell Dysonis a lead singer for the all-astronaut rock band Max Q.
Thefirst spacewalk is set to begin just before 7 a.m. EDT (1100 GMT) on Friday,NASA officials said. CaldwellDyson said the first spacewalk is dedicated to just swapping out the failedpump with a new one. On Monday, she and Wheelock will physically hook up theelectrical and liquid ammonia lines, she added. "That's,in a nutshell, what we're going to do," Caldwell Dyson said. NASAhas said repeatedly that the six astronauts aboard the station are in nodanger, but they have had to shut down many systems and leave others withoutbackups on the outpost's U.S. segment to reduce the amount of heat generated.The station's second U.S. cooling system loop is working fine with the reduced heatload. Thespace station's Russian segment runs on a cooling loop that is independent fromthe U.S. cooling system and could handle the load for a short time in theunlikely event that the second loop in the U.S. segment failed, NASA's stationprogram manager Mike Suffredinisaid Monday. Afailed ammonia pump is one of the more serious space station failures engineerscan imagine, and is one of 14 major malfunctions that NASA keeps repair plansfor just in case it occurs, Suffredini said. This is the first time any ofthose major repair jobs has been required, he added. Thespace station's faulty pump module has been at the orbiting laboratory since2002 and in use since 2006. There are four spare pumps available at the spacestation. Stationengineers would prefer to return the pump to Earth to determine how it failed,but there is no room on the remaining scheduled shuttle missions, Suffredinisaid. Thespace station is currently slated to be extended through at least 2020, thoughNASA only plans to fly two more space shuttle missions (in November andFebruary) to complete construction of the orbiting laboratory before retiringthe shuttle fleet next year. Congress is discussing the possible addition of athird and finalshuttle mission, which if approved would likely carry spare parts and othersupplies to the space station next summer. Ifthat third shuttle flight is approved, there would be room to return the pumpmodule to Earth, Suffredini said. More pump modules could also be delivered tothe station on non-shuttle spacecraft, such as Japan's H-2 Transfer Vehicle andthe private Dragon spacecraft being developed by Space Exploration Technologiesin California, Suffredini said. NASAplans to use the space station's Canadarm2 robotic arm to help move the heftyammonia pumps, but the arm system ? like many others ? is without a backup. Itwas powered down with the rest of the heat-reducing measures. Stationengineers are confident they can keep operating the robotic arm without propercooling if the system fails during the spacewalk while an astronaut is perchedat the tip. They are refining the procedures for such an event, NASA officialssaid in a statement late Monday. Wheelockand Caldwell Dyson had originally planned to perform a spacewalk Thursday tohook up a power extension cord for a future Russian laboratory and installequipment on part of the station's Russian segment. That work will berescheduled, NASA officials said. Astronautshave been living aboard the $100 billion International Space Station in shiftsfor nearly 10 years. Construction began on the orbiting laboratory in 1998. Itis being built by five international space agencies representing 15 differentcountries.